The slow worm was @SpeciesofUK from 17th to 23rd February 2013. Slow worms, despite their name, are not worms, and despite their appearance, are not snakes. They are lizards. Historically all lizards had legs so the lack of them is an evolved characteristic. There are a number of families of lizards that have evolved leglessness, many independently of each other. Slow worms are very widely distributed in Britain. 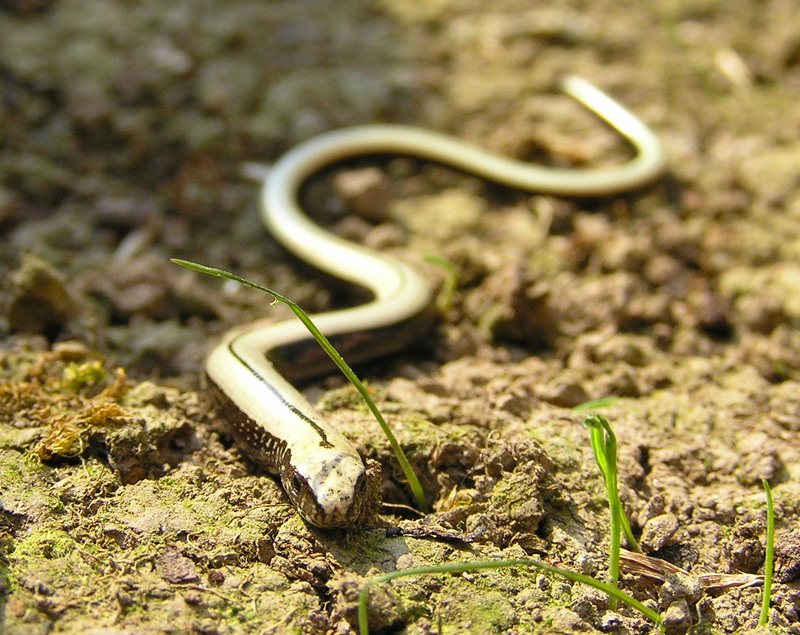 The name slow worm is ancient and can be traced back to Old English “slawerm,” meaning slow snake. It’s also called the blindworm. In the UK, the slow worm has been granted protected species status. It is illegal to intentionally kill, injure or sell them. The slow worm is found right across Europe and into western Asia, although it’s not found in southern Spain/Portugal or in Ireland. In Britain, the slow worm is found everywhere, but in general it’s more common in the south and west than the north and east. Slow worms are not rare but they are elusive. They spend most of their time in burrows underground, which they make themselves. Typical spots to find them include wooded areas, church yards, waste ground, allotments and even gardens. The best times to see slow worms in the open are: early Spring basking in the Sun, breeding season (May-June), and late summer (pregnant females basking). Slow worms like humid conditions and emerge from hiding places at dusk or after rain to hunt for food, another good time to see them. 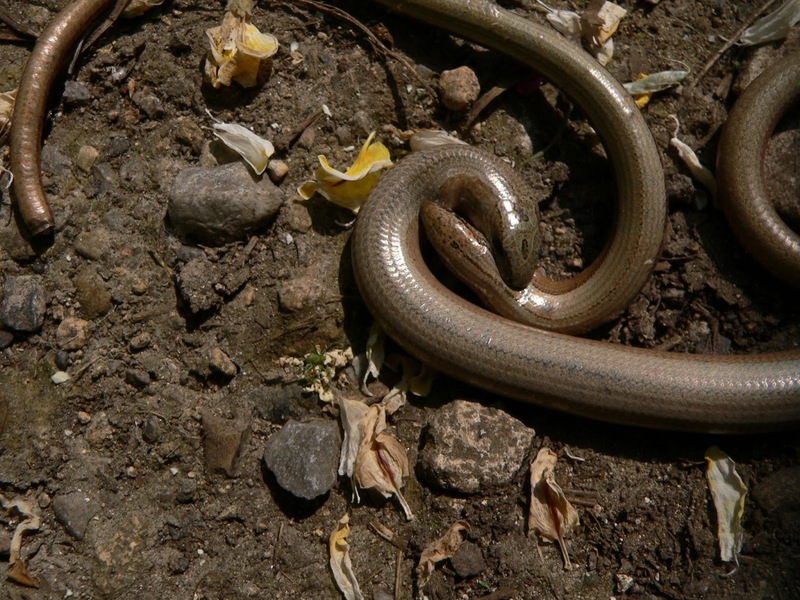 Slow worms can be encouraged to make a home in your garden by placing pieces of corrugated metal or black sheeting on the ground under which they will shelter. Slow worms, like many reptiles, hibernate. Some people would argue that they “brumate” because “hibernate” is the word for mammals, but it’s essentially the same thing. Hibernation or brumation is a state of dormancy - all metabolic processes slow right down. 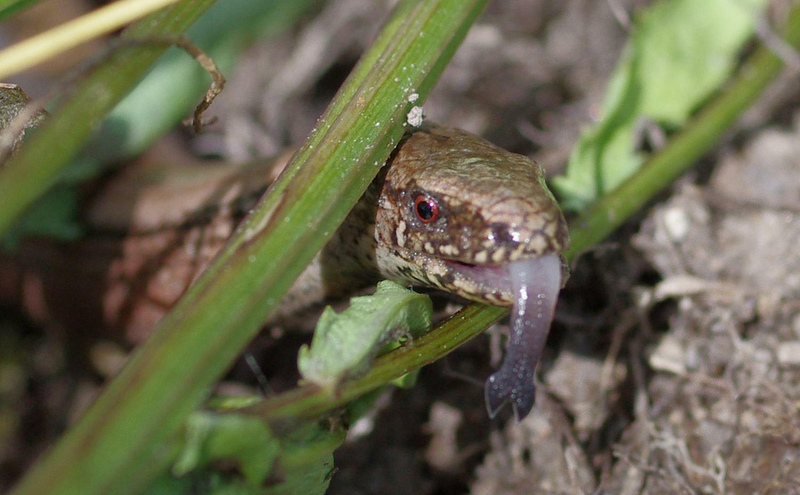 All the UK’s land reptiles do this, including our slow worms. Slow worms hibernate from October until end February/March. 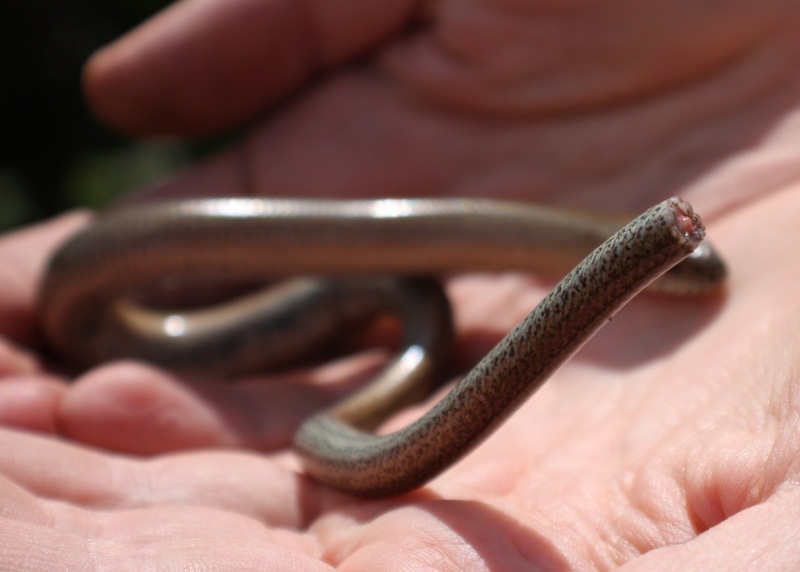 Adult slow worms have a smooth, shiny, almost “glassy” appearance. However, the males and females are very different in colour. Female slow worms are usually brown, copper-coloured or red on the back, with brown or black sides, often with light iridescent flecks, and a black belly. On most females there is a distinctive dark vertebral stripe. Male slow worms tend to be more uniform in colour, typically without flecks or stripes. Their colour can be light or dark brown, grey, bronze or brick red. Crucially, they lack the vertebral stripe that most females have. Males also have longer, broader heads, and mottled black or dark grey bellies. 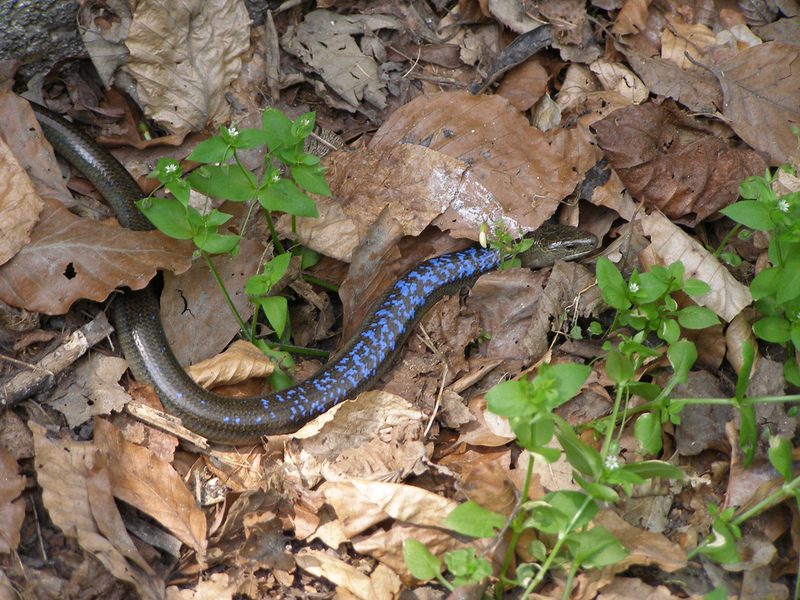 Occasionally, some males also develop extremely distinctive and unmistakeable bright blue spots. The slow worm always has 26 scales around its body in the UK. In other countries this can vary. In juvenile slow worms, it is much harder to tell the difference between the sexes. The juvenile’s back is iridescent silver, gold, bronze or copper and the sides are pitch black. They all have the black vertebral stripe that males lose after about three years, when they reach sexual maturity. Slow worms are long lived. One individual was recorded at 54 years old. They shed their skin at intervals throughout their life. 1. Slow worms are much more uniform in colour than the UK’s snakes. 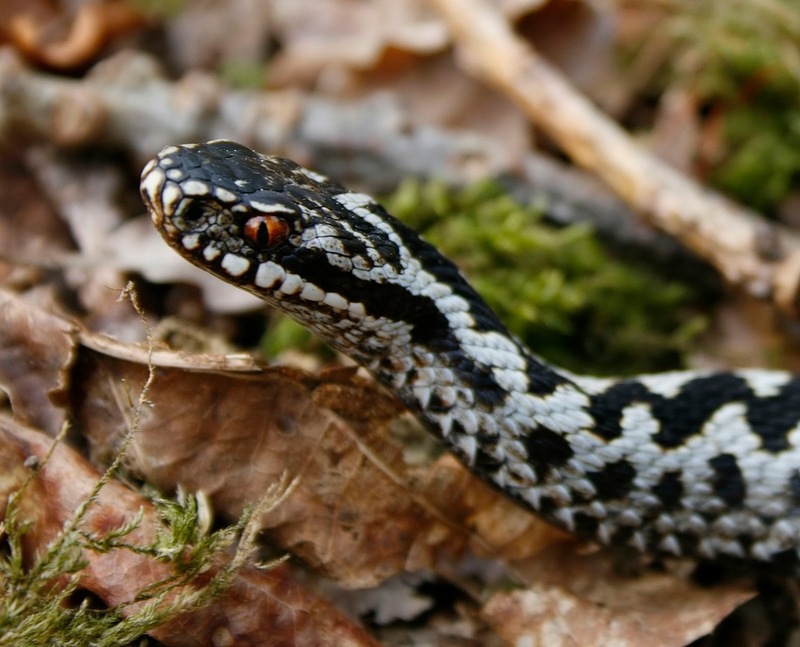 The vertebral stripe of the female is much straighter than the zigzag of the adder. 2. The head of the slow worm is indistinct from the rest of the body, whereas snakes’ heads stand out more. 3. The slow worm has a much blunter tail than a snake. 4. The slow worm’s scales are small and highly-polished, giving it a more “glassy” appearance than a snake. 5. 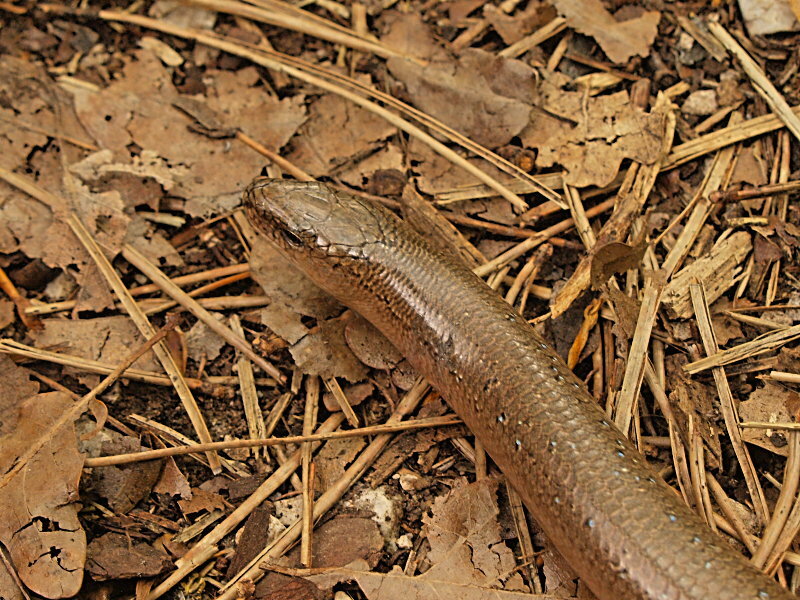 Not easy to see, but the slow worm has eyelids, a typical feature of lizards. Snakes don’t have eyelids. Slow worms are pretty slow moving, but when startled they can move quickly, as you can see in this video. They spend a lot of time in their burrows. Slow worms eat snails, slugs, worms, spider and insects. They in turn are preyed on by snakes, hedgehogs, badgers, foxes, rats, pheasants, partridges and birds of prey. In urban areas, the slow worm is easy prey to the domestic cat, against which it has no defence. Slow worm courtship happens from mid-May to late June. During mating the male slow worm seizes the female’s head, they twine their bodies together, and stay like this for hours. Here is a video. During the courting season male slow worms become extremely aggressive towards one another. You can also see a video of this. The young take 4-5 months to develop. The slow worm is “ovoviviparous.” This means the young hatch inside the female. They are “born” in a membrane that quickly breaks. This happens in August or September. Slow worms produce an average of eight young, but the number can vary between 3 and 26. The newborns are only about 7-10cm long. 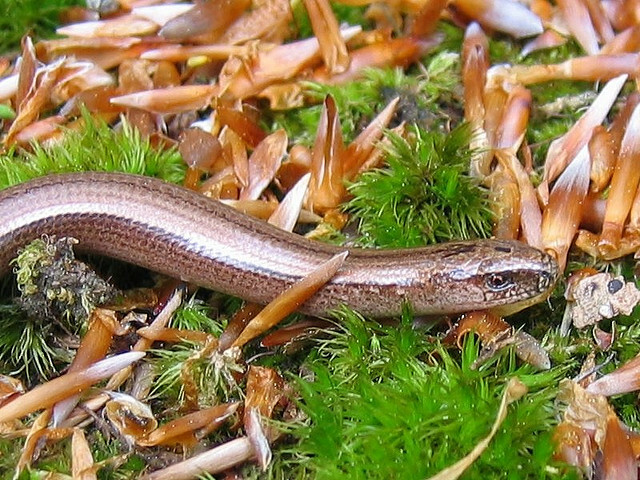 Like some other lizards, slow worms can shed their tails when under threat. It’s called “autotomy” and is a pretty amazing escape mechanism. It involves shedding part of the tail structure by squeezing a powerful muscle that shatters a vertabrae. The shed tail continues to wriggle, distracting the predator while the slow worm escapes. The new tail starts to grow back in a couple of weeks. The Latin name of the slow worm, “anguis fragilis,” means “fragile snake,” which is a direct reference to this ability to shed its tail when under threat. When the tail is still intact, it takes up most of the slow worm’s length. After it’s been shed several times, the body generally becomes longer than the tail. The genus Anguis, of which the slow worm is a species, contains only one other species, the “Peloponnese slow worm,” which can be found in Greece and nowhere else in the world.